They Know Something: Why Did The Treasury Department Just Purchase Thousands of Survival Kits For Bank Examiners? In recent years the U.S. government has been making massive preparations. They’ve beenstockpiling food, riot gear, automatic weapons and billions of rounds of ammunition. While no one in Federal emergency planning services is talking any specifics, recent exercises over American cities and military training simulations all suggest that whatever it is that the government is preparing for is a very serious affair. One possibility, as evidenced by war gaming simulations being performed by intelligence agencies, Homeland security and the Pentagon is that the U.S. economy could collapse under the weight of trillions of dollars in debt. Another points at the real possibility of a widespread attack on the U.S. power grid that could throw the country back into the stone age. Survival kits will be delivered to every major bank in the United Statesincluding Bank of America, American Express Bank, BMO Financial Corp., Capitol One Financial Corporation, Citigroup, Inc., JPMorgan Chase & Company, and Wells Fargo. The agency has roughly 3,814 employees, each of which would receive a survival kit. The staff includes “bank examiners” who provide “sustained supervision” of major banks in the United States. This, of course, begs the question: why? Does the Treasury Department know something we don’t? And why bank examiners? Is it possible someone, somewhere knows something significant is about to go down? “In the event that a debt limit impasse were to lead to a default, it could have a catastrophic effect on not just financial markets but also on job creation, consumer spending and economic growth,” the report said. “Considering the experience of countries around the world that have defaulted on their debt, not only might the economic consequences of default be profound, but those consequences, including high interest rates, reduced investment, higher debt payments, and slow economic growth, could last for more than a generation,” the report states. It’s only a matter of time, it seems. 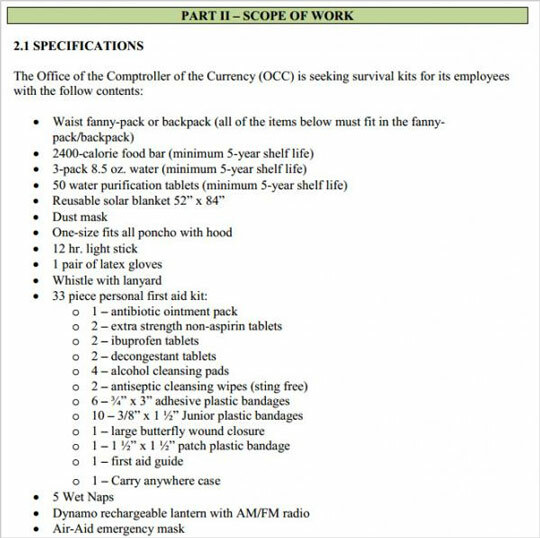 And, while the survival kits purchased by the Treasury Department are basic units that provide about two days worth of supplies, it’s notable that they have purchased these kits specifically for their bank examiners. In the preparedness community we call it a bug out bag, or depending on the circumstances, a get-home bag. They are part of a broader preparedness strategy designed to provide supplemental support to those who are away from home and out of touch in the event of an emergency. So the specific kits being distributed by the Treasury Department will provide limited support at best and are not full-out multi-month preparedness kits. Nonetheless, we are seeing the government not only regionalize distribution centers around the country and stockpile typical “prepper” supplies, but they are also now getting their individual employees and agents prepared. Those who have yet to prepare for major disasters should do so now, because if whatever Treasury and other Federal agencies expect to happen actually happens then all bets are off. When the needs of the population cannot be met in an allotted time frame, a phenomena occurs and the mindset shifts in people. They begin to act without thinking and respond to changes in their environment in an emotionally-based manner, thus leading to chaos, instability and a breakdown in our social paradigm. When you take the time to understand how a breakdown behaves and how it progresses, only then can you truly prepare for it . What’s missing from the kits above is a self defense tool. If recent events have proven anything it’s that large groups of people, especially hungry people, will turn to violence. That means you should be carrying a firearm. If you are in a state that does not allow you to do so, then we suggest adding something like a Cold Steel Rifleman’s Hawk ax to your bag. Bulk up on calories because walking during an event like a power outage is going to take a lot of energy. The Daltrex 3600 calorie bar is designed to keep you loaded up with carbs and proteins, and one bar can provide an adult with enough food for two days. Put several of them in your bag and you can survive for nearly 7 days without a grocery store. Walking, running and surviving is going to take water. Emergency water pouches are fine, but having a portable water filter or a Life Straw could really mean the difference between life or death should water utility plants succumb to power outages. Considering including some electrolytes to help prevent fatigue, headaches and other physical issues. You never know where you’ll be should an emergency happen. It may be cold and you may need to cook your food, so having a fire starter wouldn’t be a bad idea. Ready Nutrition provides a list of some very innovative and useful fire starting tools. And be sure to have a multi-tool. Among other things, they include a knife, screwdriver, and pliers, all of which you won’t need until you need them. And should you not have them you could be facing serious problems. Think back to how often you’ve used just these three items in the past and how frustrating or impossible your task would have been to accomplish without them. So, definitely put a high quality multi-toolin your kit. The above list is limited but highlights some key considerations for any short-term survival kit. For a complete list of survival tools and strategies we urge you to visit Tess Pennington’s free 52 Weeks to Preparedness online series. Someone in the upper echelons of government understands the threats being faced by Americans. Efforts are being made from coast-to-coast to prepare for these threats. 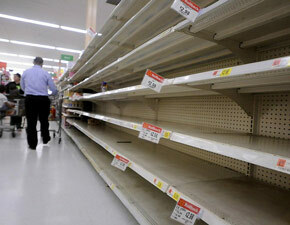 But, as even the director of Homeland Security has warned, in an emergency every individual needs to make preparations for at least a two week period during which food, gas, clean water and emergency response may be unavailable.